This one should be learnt, as it comes just up all the time, one of the most common excerpts in the repertoire, whether for a symphony or opera orchestra job. It comes at a key moment in Act IV of the Opera. Otello, the moor king, has been sold a story by the dasterdly Iago, that his beloved Desdemona has been unfaithful. This music is played as Otello enters the bedroom to go and strangle his beloved. I guess this tells us a lot of what Verdi thought about the colour and meaning of a double bass solo! It is dark and combines two of Otellos feelings, tenderness towards Desdemona and anger at her percieved infidelity. These are written in the music, as a lyrical line with the aggressive rising scale passage at the end. 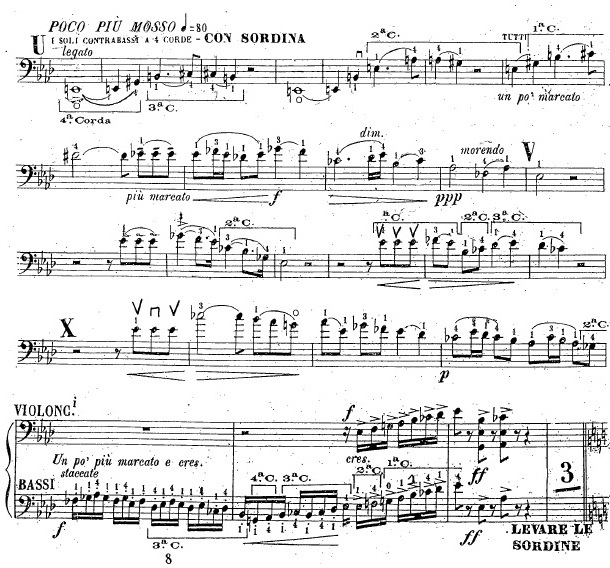 this piece is marked for "contrabassi a 4 corde", implying that at the time there were still plenty of 3 string basses in the Italian opera pits when Otello was written in 1887. Tempo and Rhythm - my version is marked crochet = 80, which is quicker than you might think. Its important to keep this going and not get bogged down, especially in the rests, keep the tempo going in your head. And play thro the 3 quaver anacrusis figure, dont let it drag. The tendancy to play this too slowly or to be late in entries after the rests must be avoided. Bow control - big issue in this one, both speed and position on the string. Bar 9 (3 before V) goes from p to f in 2 beats - the bow needs to be saved at the start of the bar, then moved towards the bridge as quickly as possibly without it being heard on the string. Bar 10 has the opposite, a dim from f to ppp in 4 beats, then morendo in bar 11, where I end up well over the fingerboard. I use a portato stroke for the three anacrusis quavers (except the ones in the bar of X). Accel - though it is not marked, it is common to do an accel some time in the last 3 bars. Do you do it, or play what is on the part? That is up to you. I playa what is on the part, but be prepared to accel if asked to do so in the audition.